Hyundai is the fourth largest car manufacturer in the world, yet its cars for long time were viewed as "value wheels". This had to change. Along with the new Sonata and Genesis, the stylish 2011-2015 Elantra shattered this perception. As of 2017, it became one of the most successful small cars. The Elantra is available as a sedan, hatchback, coupe or wagon. The sedan is by far the most common, so we will focus this review on the Elantra sedan. 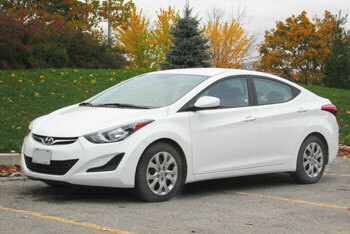 Model line-up: In the US, the 2011 Elantra sedan was available in two trim levels: the base GLS and Limited. The GLS comes with standard power windows and locks, tilt steering, iPod USB jack and 15' or 16' tires and optional Bluetooth. 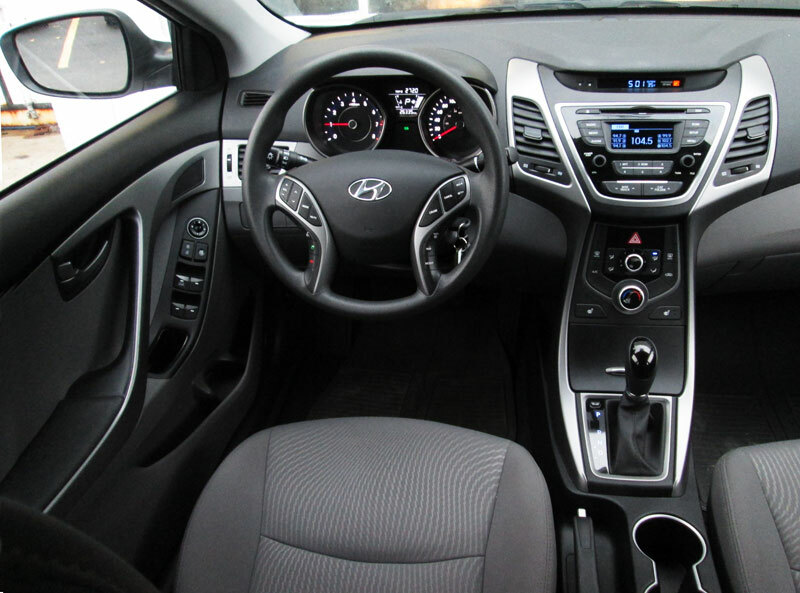 The Elantra Limited offers a sunroof, fog lights, heated leather front and rear seats and optional 17' tires. Optional premium audio system, navigation, rearview backup camera and automatic headlights were available on both trim levels. For 2014, the base trim level was renamed SE. The Elantra sedan SPORT with the 2.0L 173-hp engine was added to the lineup. Engine: The Elantra GLS, SE and Limited sedan comes with the 148-hp 1.8L DOHC 4-cylinder engine with the code name "Nu." It's a modern lightweight engine with variable timing on both camshafts. The 2014+ Elantra sedan SPORT comes with the 173-hp direct-injected (GDI) version of this engine. Direct injection means that fuel is injected directly into the engine combustion chamber under much higher pressure. The Nu engine doesn't have a timing belt, it uses a maintenance-free timing chain that doesn't need to be replaced in regular intervals. Fuel Economy: The EPA classifies the Elantra as a "family sedan" and as such, the 2011 Elantra is ranked as the most fuel efficient non-hybrid family sedan with 28/38 MPG city/highway. This translate to about 475 miles (764 km) to a tank with 80% highway, 20% city driving. To be fair, the Elantra is rather a compact car competing with Honda Civic, Toyota Corolla, Chevrolet Cruze, Mazda 3 and Ford Focus. Out of these cars, the Elantra is only behind 2012+ Mazda 3 Skyactiv (28/40 MPG) and 2012 Honda Civic (28/39 MPG). Chevy Cruze, Ford Focus and Toyota Corolla are rated lower. The Elantra SPORT sedan 2.0L auto is rated at 24/35 MPG. Mechanical: The Elantra sedan has front wheel drive. It rides on MacPherson struts in the front and a torsion bar axle in the rear suspension. Rear brakes are discs. The steering is electrically assisted. Safety: Six airbags, antilock brakes and stability control system are standard on all trim levels. Crash test results are mixed. The NHTSA rated the 2012 Elantra sedan early release with only three stars out of five in a frontal crash. The 2012 later release, as well as 2013-2015 Elantra sedan got perfect five out of five stars overall rating. The 2011 model wasn't rated. 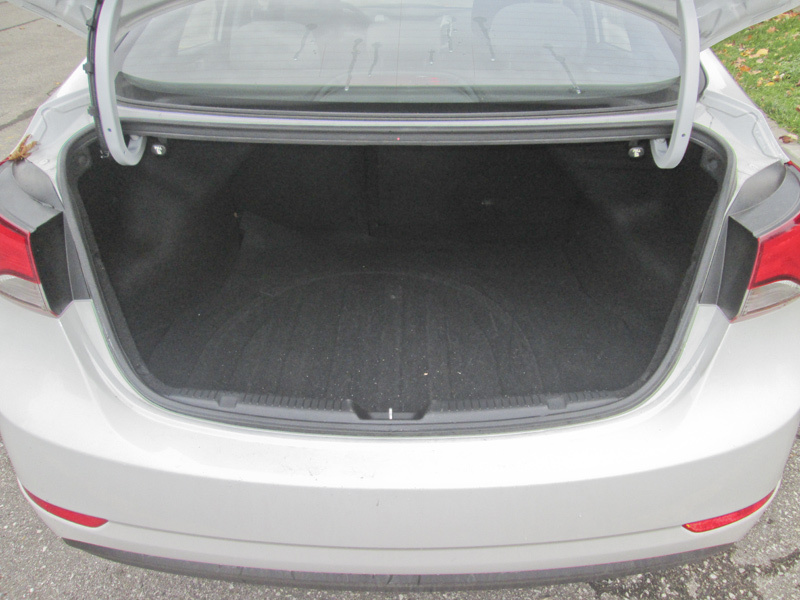 Handling and ride: The Elantra handles well and thanks to small turning radius (34.8 ft) is very maneuverable. The downside is that it's not the most quiet car. Some engine and road noise is noticeable. Common problems: Several owners mentioned audio system failure. Exhaust rattles are not uncommon, but they are not very expensive to repair. We found several reports that the engine is making a ticking noise after started cold. Some owners suggested that it might be caused by using aftermarket oil filters. There are a few reports of wheel bearing and shock absorbers going, but it's fairly common for all cars. A problem with a transmission range switch (inhibitor switch) may cause the vehicle not to start when the transmission is in Park. One symptom of this issue is when the transmission shifter position indicator "P" is not displayed on the instrument panel. The repair is not very expensive, Hyundai issued a service bulletin on this problem. The NHTSA website has a number of complaints on this issue. There are also a few reports that the leather steering wheel is peeling off. Overall, there are not too many problems reported as of 2016, which is a good sign. There were also two recalls for the 2012 Elantra; check the details at the NHTSA website. Hyundai warranty: Hyundai new car warranty coverage is one of the best in the industry. However, at the time we did our research for this review, the Hyundai USA website mentioned that the 10-year / 100,000 mile powertrain warranty coverage "applies to original owner only." Used car buyers can still benefit from the 5-year/60K mile basic warranty. On the other hand, the Hyundai brochure for the Certified Pre-owned Program mentions that the 10-year / 100,000 mile powertrain (engine and transmission) warranty is included. See details here. This means that opting for a low-mileage Certified Pre-Owned vehicle is worth a bit higher price. Pros: Styling, fuel economy, roomy interior, trunk space, Bluetooth, standard USB, iPod connection, inexpensive maintenance. Cons: Road and engine noise, not all models are equipped with a spare tire, interior materials could be better. Overall: It's a stylish compact car with roomy interior and a fuel-efficient engine. Given the crash test results and reliability data, we recommend looking for late-release 2012 and newer models. Consumer Reports rates the 2012 and 2013 Elantra as "Average" and the 2014 Elantra as "Better than average" for predicted reliability. Consider getting a good powertrain warranty, since the engine and transmission are the two most expensive to repair items. Hyundai had problems with engines in other models, such as the Sonata and Santa Fe, but the 1.8L Elantra engine doesn't seem to be affected, at least, for now. 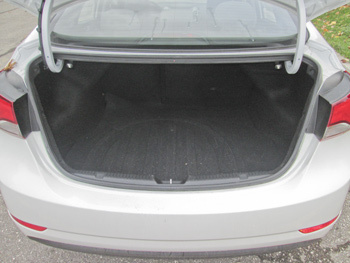 We spoke to two Elantra owners, both had the vehicle for over 4 years. Both owners were very happy with the car. One owner mentioned the peeling steering wheel as the only problem she had. We also checked hundreds of online Elantra owners reviews; most are positive. Maintenance: The Elantra is not very expensive to maintain. Regular oil changes, tire rotations, plus, after 60K, a drive belt, transmission fluid and spark plugs. Regular inspection will show if anything else needs to be done. The Owner's Manual for the 2011-2015 Elantra recommends using the 5W-20 engine oil. Oil change intervals are listed at 7,500 miles for normal conditions and 3,750 miles for severe conditions. Severe conditions include repeated short trips, extensive idling, driving in areas where salt is used in winter months, mountainous areas, etc. In our view, the engine oil should be changed at least every 5,000 miles, as some amount of oil is normally consumed between oil changes. The automatic transmission fluid is recommended to be changed every 60,000 miles (for severe conditions). Spark plugs must be replaced at or before 105K miles. Tires must be rotated every 7,500 miles. Check the full maintenance schedule at the Hyundai USA website.